The Physic Blogger: Flower Sprouts are a go!! Flower Sprouts are a go!! Flower sprouts, otherwise known as Kalettes!! Now I have to admit I didn't grow these from seeds but bought them at Thornbury Garden Shop, which is one of those garden emporiums that sells loads of plants, including home grown seedlings, seeds by weight and a whole host of things you don't realise you need until you get there! I saw these and having tried them the previous year having found them in M&S at an enormous price, really wanted to try them myself. Now I have to admit they have not been well looked after! They were left in their modules for too long, planted out and eaten by slugs almost immediately, we didn't net them until the pigeons had had a go, and I certainly haven't fed them. And for that I can only apologise to these poor plants which are now going to feed us over the winter. Particularly as they are delicious!! So what do I do with them? Well I just pop them into some salted water, let them come to a boil and remove from the heat almost immediately. 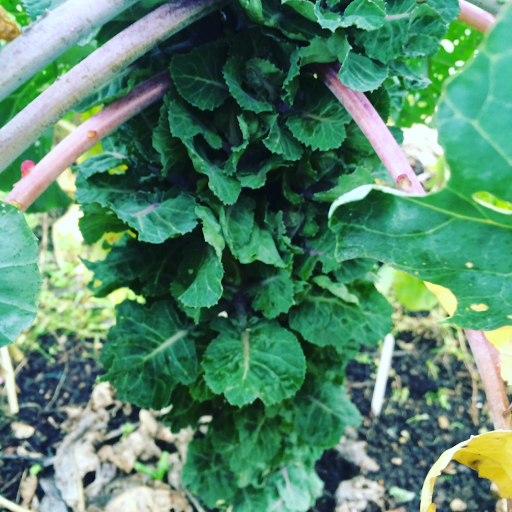 They taste between sprouts and purple sprouting broccoli and are in fact a cross between sprouts and British kale, and are not just delicious but also a really beautiful addition to the plate. Lots of people are selling the seeds right now, so if you were wondering whether to try them, I would definitely say do so. I'll definitely be planting some along with other brassicas next year! !